The causes of homelessness are numerable and the only certain solution—free housing for all—remains a civic pipe dream. But in 2015, the state of Utah was lauded for significantly decreasing its chronically homeless population by initiating a Housing First program that combined shelter with social services. Enthusiasm inspired by the program’s initial success, however, has been dampened by later setbacks. In 2017, complaints about homeless people congregating near a shelter in downtown Salt Lake City spurred the police to launch Operation Rio Grande, a controversial enforcement program that increased arrests for drug crimes and citations for public camping violations. The causes of homelessness are numerable and the only certain solution—free housing for all—remains a civic pipe dream. Anti-camping and public nuisance laws are used by many localities to prevent people from converting public spaces like sidewalks, bus shelters, subway stations and park benches into makeshift housing. These laws address legitimate concerns. 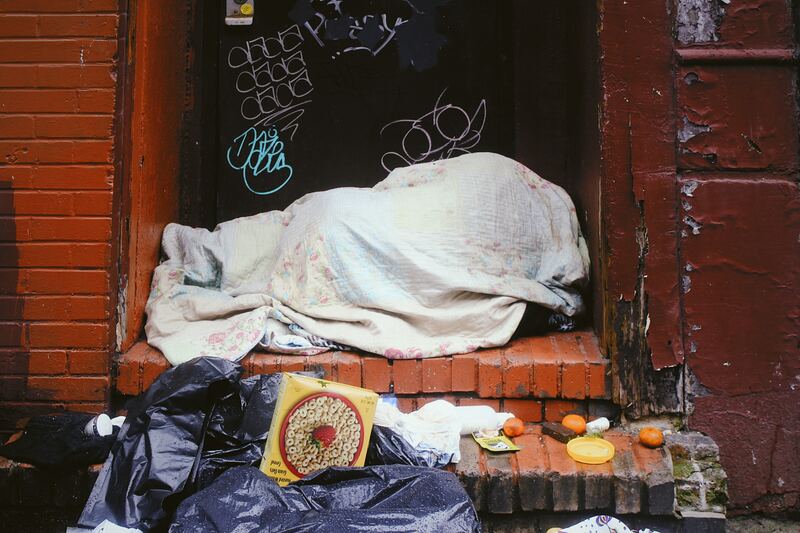 Sidewalks and doorways blocked by blankets, cardboard boxes and sleeping people risk public safety should those passageways be needed for emergency evacuations; and encampments without water and sanitation facilities can be fire hazards and breeding grounds for disease. Nevertheless, unbridled enforcement of health and safety laws may violate due process and equal protection rights guaranteed by the Fifth and 14th Amendments and the protection against cruel and unusual punishment guaranteed by the Eighth Amendment. In Proctor v. District of Columbia, a lawsuit brought by homeless residents who alleged the district unlawfully discarded property seized during encampment clean-outs, the court implicitly acknowledged the right of the district to clean public parks but upheld the property rights of homeless residents who store their personal belongings in those parks. That means towns and cities may remove private property from public spaces if that property prevents routine maintenance or poses a risk to public health and safety, but the property must be held for a reasonable amount of time and notices must be posted indicating where the property may be recovered. Although many chronics have homes, many others do not. For all practical purposes, the public streets may be home for these unfortunates not because their disease compels them to be there, but because, drunk or sober, they have no place else to go and no place else to be when they are drinking. This is more a function of economic station than of disease, although the disease may lead to destitution and perpetuate that condition. For some of these alcoholics, I would think a showing could be made that resisting drunkenness is impossible, and that avoiding public places when intoxicated is also impossible. As applied to them, this statute is, in effect, a law which bans a single act for which they may not be convicted under the Eighth Amendment—the act of getting drunk. For plaintiffs, resisting the need to eat, sleep or engage in other life-sustaining activities is impossible. Avoiding public places when engaging in this otherwise innocent conduct is also impossible. To paraphrase Justice White, plaintiffs have no place else to go and no place else to be. As long as the homeless plaintiffs do not have a single place where they can lawfully be, the challenged ordinances, as applied to them, effectively punish them for something for which they may not be convicted under the eighth amendment. The courts cannot require all communities to provide free housing and toilets to the public, but governments that want to enforce anti-camping laws must provide free access to sanitation facilities and spaces for people to sleep during the evening hours. We recognize that a State has a valid interest in preserving the fiscal integrity of its programs. It may legitimately attempt to limit its expenditures, whether for public assistance, public education, or any other program. But a State may not accomplish such a purpose by invidious distinctions between classes of its citizens. It could not, for example, reduce expenditures for education by barring indigent children from its schools. Similarly, in the cases before us, appellants must do more than show that denying welfare benefits to new residents saves money. The saving of welfare costs cannot justify an otherwise invidious classification. In sum, neither deterrence of indigents from migrating to the State nor limitation of welfare benefits to those regarded as contributing to the State is a constitutionally permissible state objective. Individual finances, of course, do impede travel and limit the ability of homeless people to move to communities with more promise. Thus, some cities provide free one-way bus and plane tickets to the homeless. This tactic is helpful for people who may need a different climate for health reasons or want to return to towns where they can live with family or friends, but it has been criticized as a heartless means of shipping troublesome residents to places from which they cannot easily return. There are no simple solutions to persistent homelessness and housing instability. People who live without a place to call their own lead difficult lives. As Langston Hughes wrote, “I beg a dime for dinner—You got a butler and maid.” We may not treat those who live on a park bench and Park Avenue as equals, but the Constitution reminds us that we should. Are the homeless violating the rights of society? The headline above is absurd. What are these rights? Do they have the right to make others sick or cause death? Are their rights not abrogated when they cause harm to others? Maybe we should discuss just what are rights and where they come from. If something is a right it was a right a hundred years ago, 500 years ago, 2000 years ago. Do not expect this journal to defend the concept that the public has a right to public streets and parks clear of squatters, feces, trash, and crazies. Why would they? They refuse to end the comments section permitting crazy squatters to constantly deposit feces and trash. I wouldn’t be too harsh on yourself. You occasionally make a good comment. I'll leave if you'll leave. Nobody wants you to leave. Certainly not me. Your comments are instructive on how you think. That is always invaluable. Mr Cosgrove has a valid point--the homeless have a right to be treated with sympathy and compassion, but since when did a deviant lifestyle become a right? If they have an addiction or a pathology because of their substance abuse which they began by choice, how does that square with the Church's teaching that wilful loss of reason is sinful? This article confuses personal responsibility with institutional responsibility---as a private citizen living in a civilised western society I pay my taxes responsibly so that my city/county/state takes care of problems like people sleeping or defecating on public streets, etc. Such problems are way too big for individuals to solve so we appoint or elect institutions/local governments to deal with them, and we have a RIGHT to expect that such problems will be dealt with in a responsible, humane manner. Getting lectured by this reporter on "victim rights" is counter-productive and solves nothing--this article is another "feel good" attempt by America mag. to show that it cares, instead it just obfuscates at best--and at worst it uses the plight of the homeless to advocate a social justice agenda which is just plain stupid. Arthur --- I wholeheartedly agree with you that we pay taxes in order to collectively address communal needs by means of our institutions and the employees of our institutions. I was considering and attending carefully to your words until you characterized constitutional/human rights as "victim rights", quotes yours. I believe the author set up the conditions for that charaterization of United States legal precedent by referring to citizens as "chronics" and "these unfortunates". Unhoused persons have the same legal rights housed people do, not because unhoused persons are "victims" or "unfortunates" or "chronics". They share the same legal rights and protections because they are citizens. Plain and simple. Of course every person has accountability. And yet that fact never strips American citizens of the protections of the Constitution and applicable legal precedent. Elaine, thank you for this primer on laws relevant to persons who are unhoused in the towns and cities where they live alongside those of us who have housing. I will print it out, study it and share it. Quick thought: I assume copy-editing accounts for your description, mid-article, of unhoused American citizens as "chronics" and "these unfortunates". Surely you did not mean to contribute to the dehumanization (exemplified by JCosgrove's comment above) of persons who live with chronic addictions in unfortunate circumstances as "chronics" and "these unfortunates" ......... as opposed to speaking of our unhoused brothers and sisters as human beings who are persons with chronic and unfortunate health conditions or behaviors in the most challenging of living situations in this winter of HOUSED people freezing on our streets. Unhoused perdons are persons, not a"chronics" and not "these unfortunates". They are first, last and always, American citizens like you and I and every other person reading and writing here. One of the smartest, wisest social service providers I have befriended and worked with is a man who lives with a crack addiction, chronic depression and has been unhoused off and on for decades. He is NOT a "chronic" and he is NOT "an unfortunate". He is a man, a citizen, a diligent advocate, a generous Catholic; he is my peer, my colleague, my fellow American, my fellow worker, my dear friend and brother in Christ who doesn't always have a roof over his head. Thank you for pointing out the problematic use of the terms "chronics" and "unfortunates." The entire paragraph in which these terms appear is a quotation from the court decision and should have been indented or enclosed within quotation marks. Thanks for the clarification. That language seemed inconsistent with the rest of your post. Apologies all, especially Ellen, the indent feature that would set off large block quotes from the court decisions was not properly applied on this piece. Thank you for the follow up. This is an important piece of writing and I will continue to share the properly edited version.